It was a picture-perfect moment, made for the TV cameras, in which a military leader stood before heroes and heroines to declare a victory which seemed to come easier than anyone dared hope, in a conflict which was opposed by many friends and foes alike. May 1 marks the fifth anniversary of President George W. Bush's "Mission Accomplished" speech, as heralded by a giant banner strung across the deck of the USS Abraham Lincoln. After shifting explanations, the White House eventually said the "Mission Accomplished" phrase referred to the carrier's crew completing their 10-month mission, not the military completing its mission in Iraq. "President Bush is well aware that the banner should have been much more specific and said 'mission accomplished' for these sailors who are on this ship on their mission," White House press secretary Dana Perino said Wednesday. "And we have certainly paid a price for not being more specific on that banner. And I recognize that the media is going to play this up again tomorrow, as they do every single year." After being landed on the deck of the carrier in an S-3B Viking 30 miles off the coast San Diego (Ari Fleischer said the president "could have helicoptered," but "he wanted to see a landing the way aviators see a landing"), Mr. Bush appeared in a flight suit to the cheers of the ship's personnel and the glare of television lights. 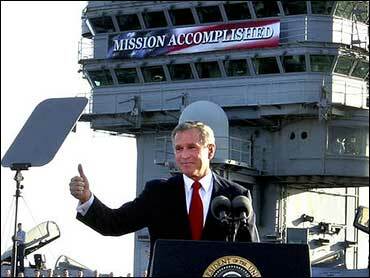 Later, he stood at a podium against a patriotic backdrop reading "Mission Accomplished." To the assembled audience and the world, Mr. Bush said, "Admiral Kelly, Captain Card, officers and sailors of the USS Abraham Lincoln, my fellow Americans: Major combat operations in Iraq have ended. In the Battle of Iraq, the United States and our allies have prevailed. And now our coalition is engaged in securing and reconstructing that country. "In this battle, we have fought for the cause of liberty, and for the peace of the world. Our nation and our coalition are proud of this accomplishment - yet it is you, the members of the United States military, who achieved it. Your courage - your willingness to face danger for your country and for each other - made this day possible. Because of you, our nation is more secure. Because of you, the tyrant has fallen, and Iraq is free. "Tonight, I have a special word for Secretary Rumsfeld, for General Franks, and for all the men and women who wear the uniform of the United States: America is grateful for a job well done." Five years after that speech, after the meaning of the phrase "mission accomplished" and when is a job truly "done" has been endlessly parsed, and after responsibility for creating and hanging the sign was first denied and later accepted, the White House said Wednesday that President Bush has paid a price for the banner, with its affirmative message becoming a target of mockery and a symbol of U.S. misjudgments and mistakes in the long and costly war - a war in which major combat operations are still being waged. The president himself didn't exactly say the words "mission accomplished," but that point often gets lost in the feelings over the continuing war, reports CBS News senior White House correspondent Bill Plante. But while the White House distanced itself from the message soon after the event, Mr. Bush was not averse to repeating it. Speaking to troops in Camp As Sayliyah in Qatar the following month, Mr. Bush said, "America sent you on a mission to remove a grave threat and to liberate an oppressed people, and that mission has been accomplished." There were intimations within Mr. Bush's speech, not excerpted and repeated as often, that the administration knew it was not about to wash its hands of Iraq any time soon. "The transition from dictatorship to democracy will take time, but it is worth every effort," Mr. Bush said. "Our coalition will stay until our work is done. Then we will leave, and we will leave behind a free Iraq." Mr. Bush, in a speech early this month, repeated the hopeful sentiment stated that day, that "while this war is difficult, it is not endless." That message may have special meaning for the crew of the USS Abraham Lincoln, on which their commander-in-chief declared "Mission Accomplished" five long years ago. Their ship has just begun duty in the Persian Gulf, within striking distance of the coast of Iran.